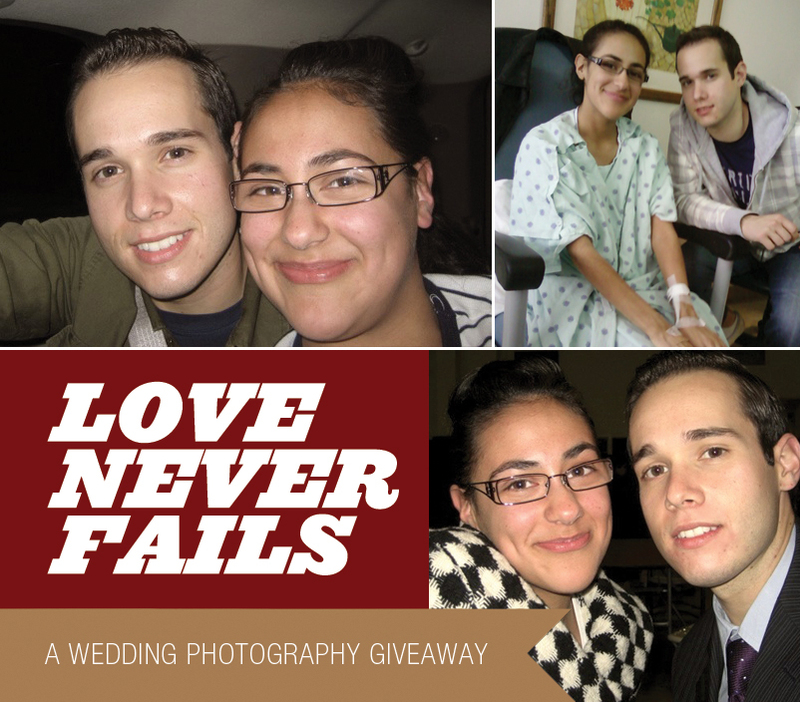 On February 14th I unveiled the first “Love Never Fails” wedding photography giveaway. When I started reading through the entries, I was blown away. Everyone has a story, and each story is beautiful and special. But this story had me in tears…when I tried to read it out loud to Cheyenne, I got choked up a number of times. This is a true story of love never failing, and I am so excited to get to celebrate Gina and Jordan’s wedding celebration on 11/11/11! I want to say a special thank you to Joan of Five Grain Events for taking the time to read each of these stories and help me make this decision! If you are in the Chicagoland area and need a great event planner, look no further! Thanks, Joan! To say that love alone is great – is folly; but when the courage to love is great, no matter what the circumstance, love never fails. Magazines, billboards, and the occasional flick would make one believe in the fairytale of love. Its images boast of an amiable life where one will always live “happily ever after”. It’s the emotion, it’s the high, and it’s the belief that love is the answer. But is it the answer? If so, then what was the question? Will that life of bliss ever come grace all of mankind? As they say, “life is a story waiting to be written.” Here is our story..
Gina and I had been dating for a little more than six months when we finally had the courage to say, “I love you.” In a society where the word “love” is thrown around so loosely in every sentence, I knew that if I was going to say – I was going to mean it. I will never forget the butterflies and those tingles that went with it — as we said it. I remember thinking “It’s these moments you never forget.” I never thought I could love someone so much and I knew she loved me too. Call it life. Call it a test. Call it whatever. It wasn’t three months later that we found our world turned upside down. Gina couldn’t stand to complain and to tell me that something was wrong was terribly hard for her to do. Every morning she would wake up having the urge to (how do I say this nicely) hurl. It was like clockwork every morning and sometimes more. It was reasoned away by her parents and they would have no talk of doctors. Needless to say, I had enough; I refused for her to let one more day go by without going straight to the hospital. By that time, her ankles and face began to swell sporadically. I was worried, and I wasn’t about to see her in constant distress. I encouraged her to go immediately to the hospital and she agreed to go have tests done. The results came in like a ton of bricks to the mid section. End Stage Renal failure (kidney disease). The doctors couldn’t believe she was still alive, her protein levels and creatinine levels were through the roof. Her body had been giving her (not so) subtle hints that there was something wrong. The doctor’s words cut into our hearts like a sword. She needed a kidney transplant immediately and the waiting list to get one was a minimum of 5 years. Furthermore, she would immediately need to be put on dialysis, blood-cleansing machine, 3 to 4 times during the week for 4 hours at a time. At only 19-year-old, dialysis wasn’t a cure — it was a jail sentence. We cried. We prayed. Nothing in life had ever prepared us for this. Neither had it prepared us for the roller coaster of life that would follow. They say that things often get worse before they’re better. For us they got down right horrible. Her health got increasingly worse as the effects of her disease took hold of her body. Her body would swell up in unmentionable ways and shrink just as quickly after going through a session of dialysis. She was diagnosed with Lupus and given at best 20 years to live. Insomnia, uncontrollable high blood pressure, and bout after bout with pneumonia made us regular customers at our local hospital. Everyone we knew with the same blood type was given an opportunity to be tested as a kidney donor. Each test came back the same — negative. Hope was as far off as me having Brad Pitt’s looks. It looked bleak and any doubts I had, I never shared them. It’s easy to feel defeated when logic, human ingenuity, and wealth can’t solve a problem. Her vibrant good health was turned off like a switch. I, knight in shinning armor, rode in to save the day but found myself unable to fix a thing. She could hardly walk without her ankles swelling up the size of pumpkins. Just thinking about it makes my heart hurt. I remember the day when, as I was pushing her in a wheelchair, she asked me if I still loved her. “Yes” I replied. In spite of it all I refused to give up on her. I knew that I loved her and I refused to quit. I could feel her look at me wondering if I would still love her. I told myself I would never treat her like she was sick and never let her be in the hospital one day without me visiting her. If I told her I loved her, I was going to make sure she knew I meant it. Would we ever be together? Will it ever end? At last we saw our first glimpse of hope. UCSF discovered that the diagnosis of Lupus was incorrect and she was free from its unrelenting fate. Further hope arrived in January 2010 when we got a frantic call out of the blue. The caller said that a mother had lost her son to gang violence the night before and his body was being kept alive by life support. Furthermore, the mother of the deceased son knew about Gina and wanted to give her son’s kidney to her. I stood there watching Gina talk on the phone [in the middle of Barnes and Nobles] trying to keep from getting too excited. Before Gina could get off the phone and tell me what had happened, the hospital called to inform Gina that tests were being run to determine compatibility. We were in shock. Could this be it? So many times we thought she had a matching donor, only to find our hopes dashed on the rocks. We prayed. Gina and I are engaged to be married on 11-11-11. We thank you for the opportunity to share our story. Now THAT is the kind of son I want to raise…. sob, sniffle, sob. Now, thats a winner! Congratulations to this wonderful couple. I know you will give them great pictures at their celebration! Beautiful story. So glad to have read about their love and courage. What a wonderful gift to a truly deserving couple! I wish them MANY years of joy together.